Nova Ren Suma is the author of A Room Away from the Wolves, the #1 New York Times bestselling The Walls Around Us, and more. Lauren is haunted by visions of missing girls—all she knows is they are all 17 years old, like she is, and they are gone without a trace. The fantastical story of two sisters named Ruby and Chloe, their strong bond, and the dead body that threatens to break it. Previously published as Dani Noir. A 13-year-old sleuth tries to solve a mystery in her small mountain town with the help of noir movies. Stories featured in Toil & Trouble and Slasher Girls & Monster Boys. Essay featured in Here We Are: Feminism for the Real World. Nova Ren Suma is the author of A Room Away from the Wolves and the #1 New York Times bestselling The Walls Around Us, a finalist for an Edgar Award. 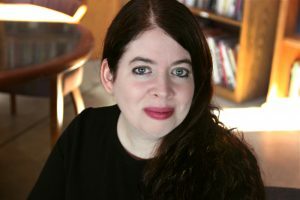 She also wrote Imaginary Girls and 17 & Gone and is co-creator of FORESHADOW: A Serial YA Anthology. She has an MFA in fiction from Columbia University and teaches at Vermont College of Fine Arts. She grew up in the Hudson Valley, spent most of her adult life in New York City, and now lives in Philadelphia.